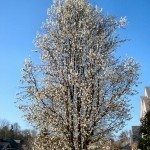 Our ornamental Bradford pear trees bloomed and then "greened" especially early this year (early February) due to our mild winter in the South (NC). Unfortunately, we had a week of frigid temps and freezing in March, and now it looks like fall in our yard. All of the leaves are browning and falling off of the trees. Will they rebloom? Are we stuck with bare trees all summer long? Many people are having the same problem this year. 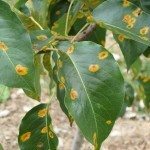 Your trees may put out a second batch of leaves, but unfortunately they probably won't bloom again. The good news is that the trees should recover and bloom again next year.